Home / DroneClash 2019: Tickets on sale now! January 16th. Delft, the Netherlands. It’s time to grab your front row seat for the world’s most spectacular counter-drone competition: DroneClash! Tickets are on sale now. With the number of teams signing up to compete in DroneClash growing by the day, March 16th’s event looks set to be an unmissable show of the bravest and best in counter-drone technology. Drones are so small and fast that, out in the open, they can be difficult to spot. At DroneClash the battles will take place in a specially-constructed arena, 20 metres squared and 6 metres high, constructed from polycarbonate – the same transparent material used in police riot-shield. The clashes, which are expected to involve everything from flame throwers to water cannons, will be at once, spectacular and safe. Visitors can alternate adrenaline-inducing DroneClash battles, with an informative stroll around the ClashExpo, where they can learn more about the rapidly developing counter-drone technology sector. Businesses will exhibit emerging technologies and offer the public a chance to see it in action. Throughout the day, DroneClash 2019 will offer a number of unique opportunities to get hands-on with drones and counter-drone technology. Further details will be announced in the coming weeks. Whether you are flying drones or simply spectating, it is sure to be thirsty and hungry work. Foodtrucks serving hot and cold drinks, hotdogs, meatballs and wraps will be on hand throughout the day so that competitors and audience members alike can recharge their batteries and be ready to do battle. 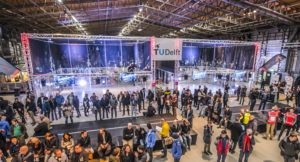 DroneClash 2019 will take place in Hangar 2 in Valkenburg, Katwijk, the Netherlands. It will open to the public at 11:00 am on Saturday 16th March 2019. The event will draw to a close, after the final battle and the crowning of DroneClash champions of 2019.